The winter of 2013 will be remembered by many I suspect as the winter of storms, low pressure systems repeatedly driving gales and rain across the Atlantic to, as many journalists would shock headline, “Batter Britain with extreme weather” . And indeed according to the Met Office December 2013 was the stormiest December in the UK since data was compiled in 1969 and the windiest month since January 1993. Now while these low pressure systems have been relentless, starting with the St Jude’s storm at the end of October 2013, but what has captured the public and media imagination is the flooding and damage that has happened and is still happening along our coasts and in many places such as near to my own home, the Somerset Levels. Pictures of people being flooded out, seawalls being demolished and communities being cut off are without doubt absolutely horrendous for those involved, even though they provide a form of smug titillation and voyeurism for the rest of us sitting warm and cosy at home. And yet as long as I can remember I’ve watched flooding on television. As a child I used to watch the village river flood, often wading through it on one of the footbridges rather than walk the long way round on the way to school, just so we could be sent back home to get changed into dry clothing. The floods which followed the snow of 1980, 1963, 1947 devastated much of Britain and across time floods have caused devastation and I remember someone saying to me “always buy a house on high ground”. And as if to prove some form of point to that, looking at the pictures of Tewkesbury Abbey, it remains afloat as it were, above the floodwaters, showing the medieval builders knew a thing or two where to build. On the higher ground where presumably local experience taught them that that parcel of land never flooded within the Severn floodplain. And this brings me to my thoughts here. Since medieval times we have increasingly lost touch with the natural world and this includes the role that geomorphology makes to the ability of the land to absorb and dissipate water. We have an inbuilt ego as humans, we are in charge. So what have we done, we’ve tamed the wetlands, draining them to produce fertile land. We’ve then built on these wetland and floodplains as the land is favourably flat, ignoring the obvious fact that floodplains are designed to hold water at time of floods. And we have canalised rivers to get the water to the sea as quickly as possible. This latter approach is very interesting as recent research is debunking long perceived notions that the best way to control flooding is to build deep straight channels, move the water quickly from one area to another. Before humans began mucking about with nature, rivers didn’t exist in the form we know today. Indeed there was a central channel of sorts, but trees, standing or fallen, impeded that flow so often a river in its mature stage could be 1-2km wide, a matrix of land, marshes, a number of secondary rivers, thick vegetation and open water. The result was that water slowly moved downstream in a way that the underlying soils or hydrology could naturally cope with. The flooding of one’s home is absolutely devastating. I’ve known a few people who this has happened to recently and I’d not wish it on anyone. But, taking the Somerset Levels as an example, flooded residents are taking issue with the Environment Agency, Government and others involved with draining the Levels arguing that not enough is being done, asking for more dredging to take place to remove the water and therefore the risk of flooding. Keeping channels and ditches well maintained is sensible; that water which falls is moved away efficiently, but what is being overlooked many times is that the Somerset Levels is there because it is a wetland and predominantly only a few feet above sea level. The very name Somerset comes from the Anglo Saxon of “'the people of the summer lands'. or in some accounts “settlers by the sea lakes”. These origins hint at the wetter than average landscape our ancestors frequented in the winter months. After a relatively benign 100 years or so some of the issues our ancestors faced we now face in the 21st Century. Before the advent of advanced drainage and pumping, it was only in the summer months that farmers and settlers could get onto the Somerset Levels. During the rest of the year as the Levels became flooded people left and lived on the higher ground. Glastonbury about 12 miles from the coast is not also known as the Isle of Avalon for fictitious purposes it rises out of a wet marsh; historically around the time of King Arthur, the lake famed in the Lady of the Lake story derived from a once stretch of open water only a mile or so away. In the last 1000 years we have played Canute with this landscape; successive generations have drained the Somerset Levels. Sea walls prevent marine invasion, a myriad of channels and interconnected ditches keep the land dry, as the landscape is often below sea level often this was through the use of major pumping systems. Over time homes and farmsteads developed and the Levels became a desirable place to live. And yes in winter it could get a bit damp in the fields but by and large the buildings remained dry. So efficient was this system of drainage that I remember myself struggling to find wetlands on the Levels when I first moved down here in the early 1990’s even in winter. Around 20 years ago subtle changes began as small areas of farmland were ‘sacrificed’ to nature. The pumps were turned off, holes were dug and many of the industrial peat workings were handed over to conservation organisations so that now the Somerset Levels are recognised as a wetland of international importance. The trickle of wetland recreation became a torrent of wetlands and fen regeneration and now one can’t move about large swathes of the Levels without bumping into egrets and thousands of wetland birds. It is a fabulous place to visit, but I’d not wish to live there. For two years now we have seen catastrophic flooding of the Levels, roads impassable and villages cut off, farmland destroyed due to standing water pumped from watercourses to alleviate flooding lower down the river systems in places like Bridgwater. Often, as happened this week, pumps are useless as they can’t pump water out of fields until river levels drop sufficiently and so the affected land and homeowners are once more at the mercy of nature. Nature is biting back, so have we reached the point where playing Canute has become as productive as trying to eat an ice cream on a roller coaster? I’m no hydrological expert, this is my opinion only, but as I see it there is a simple albeit socially contentious answer here. Should we as a society actively depopulate the most vulnerable parts of the Somerset Levels, and by doing so let nature revert that area to what it does best, a large wetland sponge? Human nature is always focussed on ways to find solutions to a problem, to drive forward with that we will win at all costs attitude. Our solution to the problem of excessive dampness in the Somerset Levels has been to play Canute “we WILL drain the wetlands, we WILL hold back the water” Well much like Canute who floated off into the Wash, it’s not looking good. So should we bite the bullet, not just on the Levels but in other areas prone to repeated flooding, is it time to be honest and admit we’re fighting a battle we can never win. Even with the arsenal of modern technology we have at our disposal, as we have sadly seen some parts of the Somerset Levels are becoming uninhabitable for a reason, there is nowhere to move the water to. Dredging the rivers will help move water once it’s in there, but it is a never ending task, and moving the water elsewhere often creates further problems downstream. Vast resources both technically and economically will be needed if as predicted sea levels rise and as the atmosphere warms, the energy available to create what was once a freak storm or prolonged torrential rain will increase and potentially we could see annual catastrophic flooding. I listened to a farmer from near Tewkesbury at the weekend, he himself said his farm would not be a viable business in 20 years as the flooding is becoming too frequent. Should we not then as a country have a serious robust honest conversation with ourselves and say, we will compensate everyone who now lives or makes a living in certain area, we will help move them lock stock and barrel to somewhere on higher ground. And then in that area, defined by experts in hydrology we switch off the pumps, let the area slowly revert to wetland and we leave it for nature to re-colonise. It has a precedent in a way with the slum clearance movement at the turn of the 19th century. As a society we said we cannot expect people to live in such appalling conditions. We moved people out, built new housing and over a period of 50 years changed the landscape. Am I the only person who finds images of people being flooded out year after year appalling? Yes dredging and wetland management may sort out the problem, but in the long term I just don’t see this being sustainable. Many people I’m sure will be reticent to move, others will I’m sure discuss my thoughts in terms of social cleansing. Far from it; if all things were equal, the status quo could remain. From what I have read over the years hydrological change is on the way, not today, but in the decades to come. This is about humanity. If the scientists are right and human activity has caused climate change, that climate change is now inflicting a serious cause and effect on innocent people getting on with their daily lives. Should we not then as intelligent compassionate humans seek a solution which if it worked through properly could not only provide long term stability to those who live there but provide a wetland in Somerset that would rival the Camargue in France. In a small way we would be putting something back. Nature seems to be winning this battle, why not let nature win the war, on parts of the Somerset Levels at least. A dignified retreat. It may be a New Year but 2014 has arrived in Wiltshire as it pretty much left 2013 with deluge after stormy deluge playing havoc with us over the Christmas period. Yet another low pressure is sweeping across the Atlantic to batter the West and South of Britain. As I write this there has just been a gust which rattled across the house like an express train. Second recording: This time as the wind and rain blew outside I wanted to record the sound of rain battering the window in the office, something I have heard many times before. Final recording: My final recording from New Years Day is from inside the greenhouse. 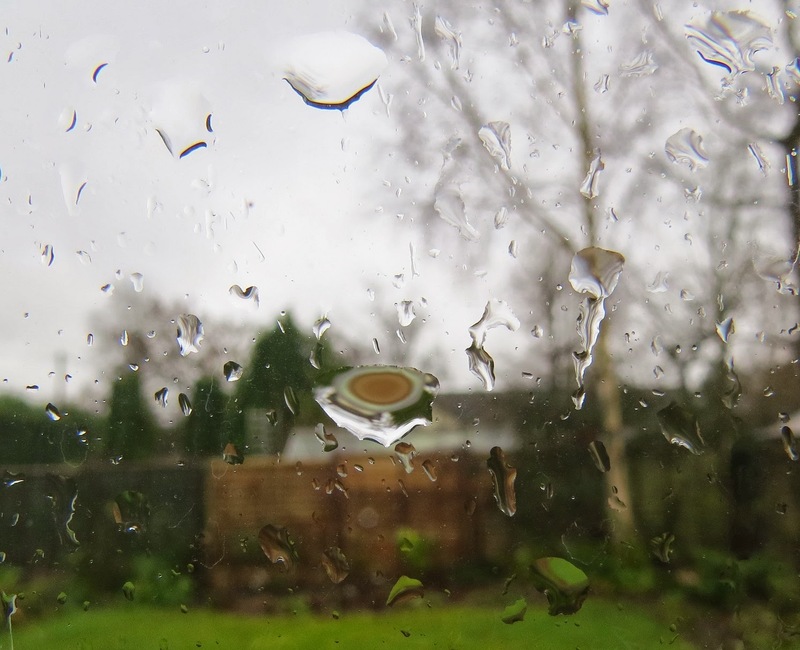 I love the sound of rain on the glass when working away in there, and today with the storm raging it really says wild elements to me.